Have you ever tried to put a hold on a brand new movie that hasn’t even been released yet on DVD, and found out there were already 73 people ahead of you in line? With Saved Searches, you can beat the crowd and put your hold on new items soon after they are available in our (pretty awesome) Catalog. Saved Searches are helpful when you’re super-excited about an upcoming title. Or when you want to be first for new books by your favorite author. Or you want to read everything new about a particular subject. specifically as possible. If you are waiting for a new title to appear, enter the title exactly, and select title from the drop-down menu. Determine the settings for your email notices. When you want to stop receiving email notices, log into your account and click the red X next to the search. 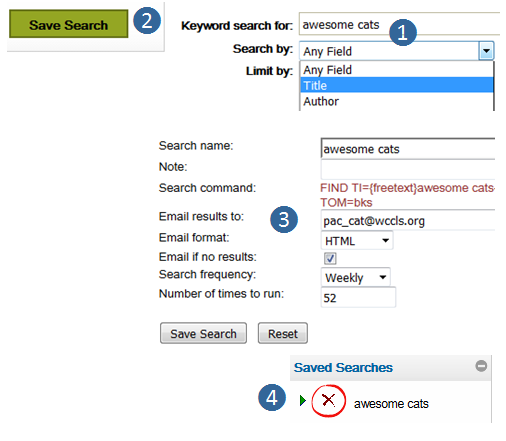 For more about saved searches, check out this three-minute video! This is the second of eight weekly tips about our online library catalog.